An elastic platform for testing complex distributed large software systems. The most limiting factor in development today is software validation, which typically requires very costly and complex testing processes. ElasTest pretends to improve significantly the efficiency and effectiveness of the testing process. The project aims to build an elastic platform that eases the testing phase for large and distributed software systems. This is done in order to reduce the time-to-market of the software projects and increase its quality, quality of service (QoS) as well as its quality of experience (QoE). 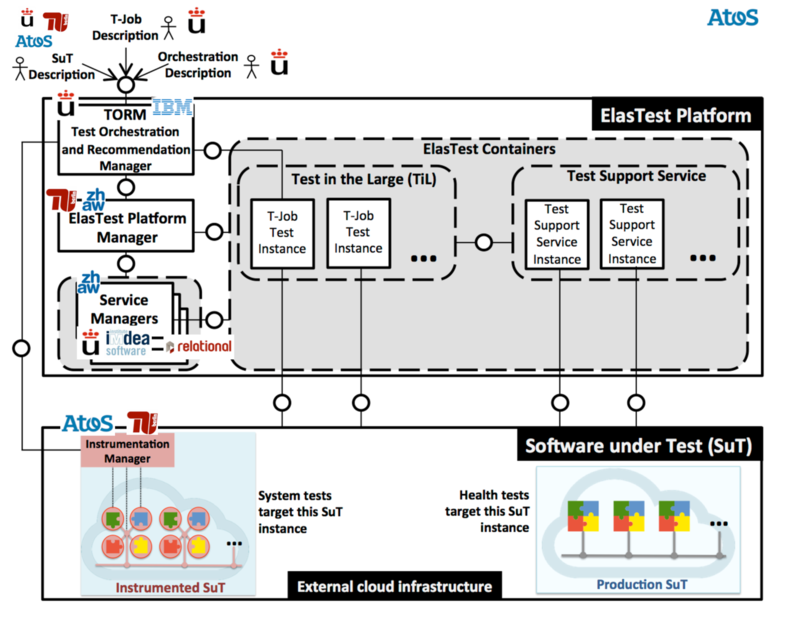 ElasTest (Project ID: 731535) will also develop a novel test orchestration theory and toolbox enabling the creation of complex test suites as the composition of simple testing units (T-Jobs). ElasTest just started on January of 2017 and its consortium comprises of 10 partners including IBM, ATOS, Technical University of Berlin and is coordinated by the University of Rey Juan Carlos. In this project ZHAW is going to be working on the development of the ElasTest Platform Manager (EPM) and the ElasTest Test Orchestration and Recommendation Manager (TORM). The EPM is the interface between the ElasTest testing components (e.g. TORM, Test Support Services, etc.) and the cloud infrastructure where ElasTest is deployed. This platform must abstract the cloud services so that Elastest becomes fully agnostic to them and provide this abstraction via Software Development Toolkits or REST APIs to the users of it. The objective of the EPM is to implement such a Platform Manager that enables ElasTest to be deployed in a target cloud infrastructure (e.g. OpenStack, CloudStack, AWS, etc.). SuT (Software under Test) specification. Developers need to be able to specify their SuT so that the TORM can execute the tests on it. Engine Hosting. The TORM enables engines to be plugged as modules. Development APIs and interfaces. The TORM is the main entry point for testers, that is why it needs to expose the appropriate interfaces and tools enabling developers to consume the different capabilities exposed by the platform.